January has been designated by pro-life organizations as Sanctity of Life month. The 23rd of January is the Sunday this year where churches are suppose to focus on the value and sacredness of human life. Before I go any further, let me be perfectly clear that this blog is written by someone who embraces the sanctity of life. So please do not misinterpret what is to follow as lack of concern for the unborn. Limits or laws restricting the purchase of firearms. Welfare/social services/food stamps for the poor. Laws that protect children/ adults from bullying. Laws that prohibit discrimination because of race, gender,sexuality. Affordable healthcare for all individuals. There are more, but I will not belabor my point. Some of the things listed above are meant to protect people and some of those things discriminate or destroy people. Yet, outside the issue of abortion many pro-life individuals embrace life destroying ideology and do not see ALL humans as important, unique, special and sacred. They select a small sliver of life and make that the battle ground. The outsider, the one not in the inner circle of the “religious”, recognizes this dichotomy correctly as hypocrisy. So my plea to fellow believers, change and broaden your focus, or change your name. Sarah Palin hymn and who’s yer dadd..(I mean brother and sister)and more! Does the value of life depend on anything? For example, I have heard people argue that if someone commits a crime they have lost their right and therefore, the death penalty is not a pro life issue. How do you answer this? The bible says we are supposed to forgive. Therefore they would be going against a very simple command in the bible by saying someone who commits a crime has lost their right to life or anything else. It is a terrible thing when someone so flippantly ends the life of another person(s). That person needs to pay for that disregard for human life, and that payment is the loss of their freedom for the rest of their lives. To end the life of the murderer by imposing the death penalty just reinforces the notion that there are limits in valuing life. All life is valuable including the life of a murderer.The death penalty does not deter violent crime, if anything it is a weapon of revenge. I agree Mark and Ben. I believe there is a difference between rights and value. The value of life must be consistent–it cannot depend on anything outside for value. To discredit life based on an outside value, devalues life itself. Who determines the value of life if it is based on behavior or anything else? It is a shame as Christians we choose to make that judgment call and determine what life is to be valued and which lives are not. I believe it is hypocritical and testifies against our belief that God is Life. Yes you have hit on something that most people ignore and that is people using an emotional issue for a political agenda. I spent some time with a brother who had the conservative, pro-life agenda a little while back. He was going on about how our country is going down hill with all the liberalism around and simply pointed out that Jesus certainly never taught us to change the government–in fact seemed to prefer the separation, saying, give to Ceasar what belongs to him and to God what belogs to God. The Romans/Jews had an interesting separation of church and state at the time. The jews were responsible for dealing with Jewish law as long as their solution didn’t conflict with Roman law. It was only after Constantine that the church began to interweave it’s agenda with that of the government. I suppose my point is that while we can and should vote our conscience on issues, we shouldn’t see political opposition as an attack on God. This is what leads to people killing doctors and social service workers. As Christians, our method for making a difference is absolutely contrary to enforced policy decision in that even in the Bible we we learn that conformity and even goodness that doesn’t come from our core being is an offense to God. Our method, at least as taught by Jesus in words and example is to engage in spiritual growth that molds us, trains us, much as the master of a vinyard trains his/her vines. We live as Christians and as such demonstrate the wealth and joy of following the path, thus drawing others to our number, not out of coersion but because they really want it, and then we see changes happening. The true christian solution to the abortion issue is or should be that we rise up, use our resources to make options more readily available to those who unfortunately find themselves needing to choose, rather than taking away their right to choose. If we’ve done our job on both ends, fewer women would make that choice that pro-life people so abhore. Again, it’s unfortunate that many prolife people want to save the baby before it’s born but once the child is with us, the mother who found herself in desperate spot is left to HER on resources as to the raising of that child. Legislating morality is always a difficult issue because it is often at inherent odds with the ethical implementation of governance. Who really, apart from gay people, cares about gay marriage emough to oppose it? Only those who through ignorance and bigotry fear that the devil is somehow taking over the planet with it. (Wake up, the devil doesn’t need this issue and we Christians KNOW how the book ends.) Who doesn’t want to see universal health care other than those who think that their pockets will be emptier once it is provided or those who fear the exposure of their manipulation of our society for their own profit. These people aren’t defending God in their actions, they are hiding their sin (bigotry, pride, anger, profiteering, gluttony, selfishness, bitterness) behind a facade of holiness. Jesus called such people, white-washed tombs filled with dead men’s bones. Second, while I agree with you that the civil law of the land (the Constitution), in my opinion, does not require the limiting of marriage, I would not say that opposing gay marriage incompatible with pro-life. 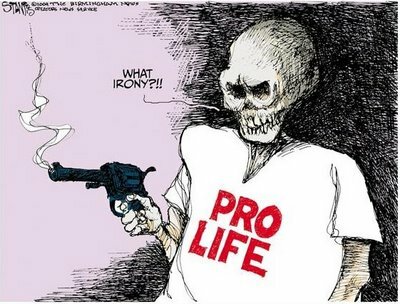 Likewise, arguing for the protection of the right to keep and bear arms is not incompatible with pro-life. I would respectfully argue that history shows us there are some aggressors that will not respond to anything other than deadly force. Lastly, I think it is easy to vilify those with whom we disagree. For example, one of the replies refers to a mother with a child; the child’s life is promoted, yet the mother is left to her own resources. The indictment is a lack of compassion, at least it seems. And in some cases I am sure that’s true, but I doubt that is the only reason. But getting back to my original comment for you, the issue you’re pointing out – the hypocrisy of men – is a dire matter. oops, typo…. the opening word of my post should have been I…. not Id. what would my English teacher say!